Colorful bracelets have become all the rage at Disney's (DIS) Florida theme parks. The MagicBands allow users to get into the parks, access expedited queues and -- if they're staying on-site -- pay for food and merchandise. They raise the bar for the theme park experience, but they're little more than RFID chips dolled up as fashionable wristbands. They don't do anything on their own. They are not battery powered. They don't offer up any LED displays. 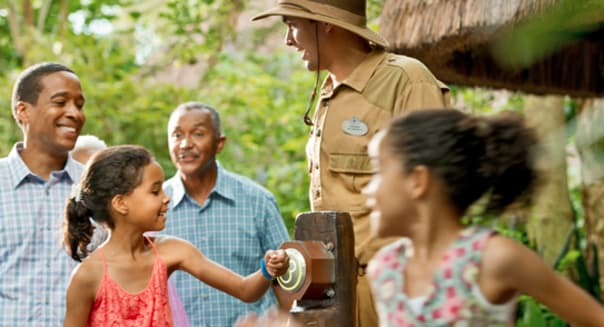 They simply interact with Disney's growing fleet of scanners at entrance turnstiles, ride entrances and cash registers. What if these bracelets could do more? What if MagicBand told time, interacted with the My Disney Experience app or tracked wearers' vigorous activity while walking through the theme park? Yes, what if Disney's MagicBand could also be a fitness bracelet or a smart watch? What if Disney acquired Nike's (NKE) fading FuelBand business? Nike's FuelBand is on the way out. The athletic footwear and apparel giant once had a hit on its hands. The $149 Nike+ FuelBand hit the market blazing in early 2012, quickly selling out of its initial supply. The wristband's three-axis accelerometer tracked movements, while the LED screen served as a clock, also measuring calories burned, steps taken and a proprietary metric called NikeFuel that gauged the vigorousness of a day's activities. Nike should've had a winner, but it blew it. First, it made its big push when the cheaper FitBit wireless trainers and Jawbone Up bands were already on the market. It also turned its back on Android, only offering iPhone owners the ability to use Bluetooth to wirelessly update their NikeFuel tallies on their smartphone apps. One popular theory is that Nike didn't let its device play nice with the world's leading mobile operating system because Apple (AAPL) CEO Tim Cook was on Nike's board of directors. Now that Apple is rolling out a smart watch of its own, it seems silly that Nike never got around to respecting the growing base of Google's (GOOG) Android users. Despite the global appeal of the Nike brand, the FuelBand suffered. Nike laid off the majority of the device's hardware team in a springtime cleaning back in April, discontinuing work on a slimmer model that was supposed to hit the market later this year. That brings us back to Disney. The MagicBand starts at just $12.95. It has been given away in the past to resort hotel guests and annual pass holders. Disney does sell character-themed bands and add-on bling at a premium, but it's a cheap way to keep an ID chip on as many guests as possible. Disney doesn't have to give that up, but what if it snapped up Nike's seemingly dormant FuelBand business to give guests a premium MagicBand experience? For those guests who don't mind paying up for a themed fitness bracelet -- and don't mind dealing with the recharging process every handful of days -- why wouldn't Disney jump into the booming niche of wearables? Disney also owns ESPN, making the rebranding process a no-brainer. An ESPN MagicBand would do everything that the existing MagicBand does at the parks, but also serve as a fitness tracker. It could also evolve with some smart watch features that would push notifications to the LED screen on FastPass changes, ride outages, short queues or even flash sales. Disney's MagicBand is just scratching the surface. If the House of Mouse takes this opportunity to rescue Nike's dying platform, it could bring the magic to a whole new level. Motley Fool contributor Rick Munarriz owns shares of Walt Disney. The Motley Fool recommends and owns shares of Apple, Nike, and Walt Disney. Try any of our Foolish newsletter services free for 30 days. Check out our free report on the Apple Watch to learn where the real money is to be made for early investors.